Hello all! Since starting my own revamping’s in 2016, I’ve been expanding my newfound style throughout my home. This weekend I got to cross off a long-awaited item on my to-do list. I finally recovered and refurbished chairs for my living room! I don’t know about you, but there’s just something exhilarating about giving new light to something that’s been sitting in the dark. 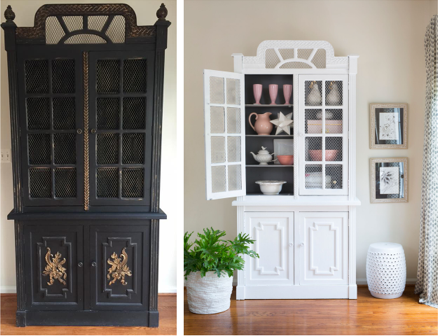 Whether you have a sentimental piece you just can’t part with or you don’t have the budget to buy, restoring something to its true potential is just as refreshing as buying something new. All it takes is a few coats of paint, maybe even some fabric and a little bit of elbow grease. 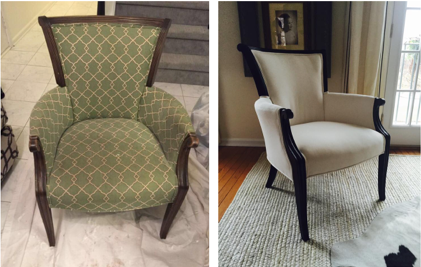 Here are some of my favorite refurbishing projects of my own! Loving my ‘new” chairs! For this I used Sherwin Williams “caviar” and a white sunbrella fabric (perfect for kids and pets)! 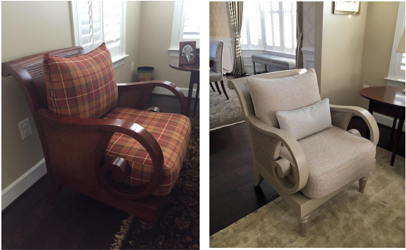 One of my clients was looking to re-do their living room. When I came across this chair I told them they just couldn’t get rid of it! So happy with the results! Finally, another piece from my home. I have had this armoire for quite some time until I finally decided it needed a facelift. Don’t forget to really look at the bones of your furniture before tossing it to the curb!